A near perfect day greeted both Eastern Suburbs and Hawkes Bay United as they kick of the ISPS 2018/19 in the leafy East Auckland suburb of Kohimarama. For the first time since their reintroduction to the top level of football in New Zealand two seasons ago, Suburbs would be walking out onto their actual ‘home’ pitch, in what was an eagerly awaited appearance by their 2000 plus members that are part of the club. If one word could describe both teams prior to the games kicking off it would be “change”. It is a little under 12 months since this corresponding fixture last season was played, and of the 32 players involved in both squads on that day, which was a 1-0 away win to Hawkes Bay United, there are only 4 players making the return, two for each team. For the home side, they are there are their talismanic captain, Tim Payne, and joining him back in the white/yellow and black is Andre De Jong, who lead the goal scoring charts for the home side last season. For Hawkes Bay United only MacKenzie Waite in goal, and Karan Mandair make the visit back to The City of Sails. Suburbs also come into the game following their partnership with the Ole Academy during the ISPS Winter Break, with no less than half of their squad for today’s game coming via this source. The players made their way onto the pitch just before the scheduled start time of 4pm, and once the pre-match formalities and handshakes had taken place, the referee for the game, Anna-Marie Keighley blew her whistle for game, and season, to begin….and we were off. The game kicked off with Eastern Suburbs in the Hawkes Bay half, however a long racking ball from Hawkes Bay which found the evergreen Paul Ifill, making the move to Hawkes Bay from Tasman during the offseason, stretched the Suburbs back four, and it was only poor footwork from Ifill which caused the move to breakdown, when very promising. A couple of soft fouls by Hawkes Bay players saw Suburbs slow the game down, and after just six minutes, it was this slowing of the game, and drawing the Hawkes Bay players forward to chase the ball, meant that a ball over the top from the Suburbs midfield was able to find Andre De Jong baring through on goal with just the keeper to beat. As Waite, in goal for Hawkes Bay United came out to meet him, De Jong was able to lift the ball over the keeper and into the back of the goal. A flying start to the season from Suburbs and their home fans. After 12 minutes the home side was almost able to double their lead when Kingsley Sinclair found himself one on one with the keeper, after another great passing move by the Suburbs midfield. Sadly, for him and the home side, the finish wasn’t as good as the passing leading up to the chance and Waite was able to save easily diving to his right. Sinclair should have done better, yet the home team was on top and giving their fans lots of encouragement. Following the chance, the Suburbs midfield was proving to be quick, fast, and agile in their movement around the pitch, and were giving the Hawkes Bay teams a torrid time trying to close them down. Niggly fouls were still happening, and the referee was doing her best to keep things flowing. However, after 23 minutes it was one foul to many, and Daniel Allan for Hawkes Bay United found himself in referees’ notebook for a strong challenge through the back of a Suburbs player. Hawkes Bay at this point of proceedings were struggling to get into the game, and barring a free kick close to the Suburbs 18-yard box, which was poor in its delivery, they were unable to offer anything else in the first 25 minutes of the half. Suburbs however weren’t willing to dwell on the one goal lead they had and just prior to the half hour mark, they were able to double their lead, when De Jong made his way until into the Hawkes Bay box, and as players rushed to close him down, he was able to square a pass across the goal, and Kingsley Sinclair was there to bury the ball past the hapless Waite. The crowd erupted and the Suburbs players celebrated, as the Hawkes Bay players made the long trek back to the half way line. The final third of the first half, continued to see Suburbs in the ascendency, however as the half came to a close, and Suburbs were pushing forward seeking a third goal, there were a few gaps in the Suburbs back four, which some raking balls from Hawkes Bay tried to exploit, however on both occasions the assistant referee flagged the Hawkes Bay forwards offside. The 4th Official held up his sign for two additional minutes to be played, which were uneventful, and Anna-Marie Keighley blew for halftime. After the half time break, only Eastern Suburbs emerged from the changing rooms, as Brett Angell kept his players on the pitch during the half time break to dissect the previous 45 minutes. The game resumed with only one change, that being for the visitors, with Daniel Allan, who was on a yellow card, being replaced by Karan Mandair. As the second half got into its rhythm, Hawkes Bay United began to work themselves into the game. Paul Ifill had been moved into a more central role, and he was beginning to spray the balls left and right to the Hawkes Bay wide players who were beginning to get their crosses in, and after ten minutes Ifill himself had a great chance to bring his team back into the game, when a cross from the right wing found him in space 8 yards out, however his header which despite being met with power never had the direction. It was a big let off for Suburbs, and a potential game changer as within a minute Suburbs won a freekick 25 yards from goal. The ball was swung into a dangerous area, and whilst the first cross was unsuccessful, from the second phase the ball was chipped back in, and met by the head of Mohamed Awad, much to his delight, and he wheeled away to celebrate his first goal in the ISPS Handa Premiership. Following Suburbs third goal, the heads of the Hawkes Bay players began to drop, and their frustrations began to come out. This resulted to a couple of quick yellow cards to Sam Mason-Smith and Jorge Akers for some over vigorous tackles. The yellow cards were also mixed in with the final two substitutions for the away team, with Jordan Lamb replacing Paul Ifill, and Dilan Nanayakkara coming on in place of Joseph Zupo. For the away team the changes sadly didn’t help to limit the freedom that Suburbs were playing with, and this freedom in and around the Hawkes Bay 18-yard box, resulted in a nice passing movement which culminated with a second goal of the game for Kingsley Sinclair. For Hawkes Bay they still had 20 minutes to play to try and stem the tide of goals which was enveloping them. After the goal, Suburbs made a couple of quick changes with Kelvin Kalua making his way onto Madills Farm in place of Dalton Wilkins and double goal scorer Kingsley Sinclair being replaced by Matthew Garbett. Hawkes Bay threatened the Suburbs goal a couple of times in quick succession, however their finishing was poor and Withers in goal for Suburbs wasn’t troubled. This poor finishing however once again proved costly, when Suburbs won a corner, and the corner was met powerfully by Suburbs’ big centreback Nando Pijnaker, and the ball ended up in the back of the net for the 5th goal for the home team. With time running out Suburbs made their third and final substitution of the day with Patryk Misik coming onto the pitch for the final 5 minutes replacing Campbell Strong. Four minutes of additional time were to be played and whilst both teams had a couple of half chances each, as the game began to get stretched, there was no further addition to the score by the time the referees whistle blew to end the days proceedings. 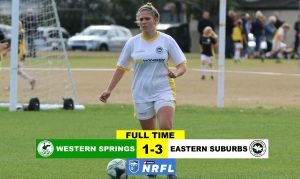 Eastern Suburbs scored their second 5-0 win in a row at Madills Farm and, for the second week in a row, Jade Parris came away with a hat-trick. it was a confident performance by Suburbs and there could easily have been more goals in the game as the Lilywhites were 3-0 up within the first half hour and looking to be in complete control. Three Kings played very deep in the first half and left themselves vulnerable to the bustling runs of Jade Parris and Hannah Pilley, but they managed to restrict the score to three goals and the visitors were much more positive in the second half. Suburbs were missing a number of players to the U20’s NZ team currently playing in the world cup in France and they have also lost their two Korean girls who have returned home. It was therefore up to the other girls to step up and they did just that, particularly in the midfield where Kate Seater and Lucy Carter covered a tremendous amount of ground. Molly Bryans made sure her last game of the season before returning to her studies in the US was a good one and she was highly competitive and energetic in midfield. The game started well for suburbs who launched a number of attacks in the first few minutes. One of these lead to the first goal when Jade Parris forced her way past a couple of defenders and attempted a shot from long range. She appeared to slip over as she took the shot and the ball squirted off her foot into the path of Hannah Pliley who directed a firmly hit shot from the edge of the penalty box into the roof of the net. The second goal came from a nicely worked combination of passes just outside Three Kings penalty area which had the visitors defence confused and when Jade Parris found a couple of yards of space she made sure she took advantage by placing a low shot into the corner of the net. Goal number three came soon after and was the result of another powerful run by Parris who looked like she had been tackled a couple of times but used her strength to keep going almost to the goal line before unleashing an unstoppable shot from a tight angle into the top right hand corner. The second half was very different to the first as both teams struggled to launch any penetrating attacks and it was punctuated by a number of injuries and lengthy stoppages for free kicks which upset the rhythm of the game. 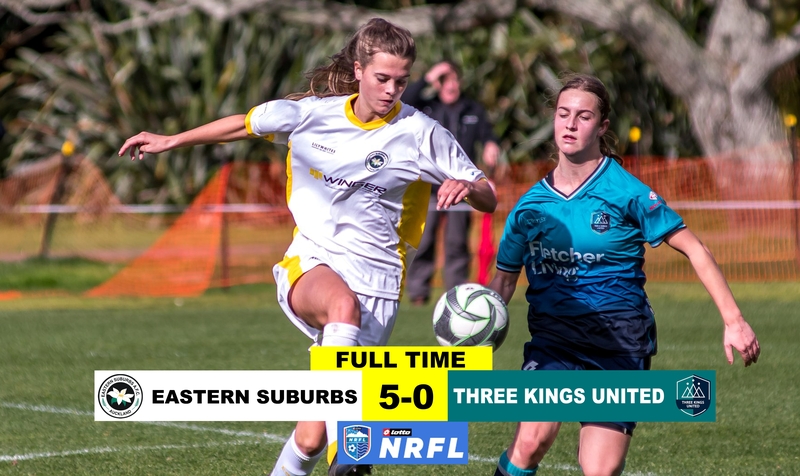 Three Kings managed to put together a few good moves of their own and they were much more lively in the second half, but rarely troubled Corina Brown in the Suburbs goal. The Lilywhites had to wait until the 86th minute before adding to their first half tally, when they managed to break out of defence at speed, releasing Hannah Pilley whose well weighted through ball to Jade Parris left her one on one with the keeper and she made no mistake for her hat-trick. The last goal came in stoppage time at the end of the game. The tired Three Kings midfield could only watch as Suburbs passed the ball around in neat triangles, finally finding Lucy Carter who made some space for herself and beat the keeper with a powerful shot from 20 yards out. This was another very satisfying performance and, with ten goals in their last two games, Suburbs will be hoping they can maintain their momentum into the last few games of the season despite the enforced changes to the team. 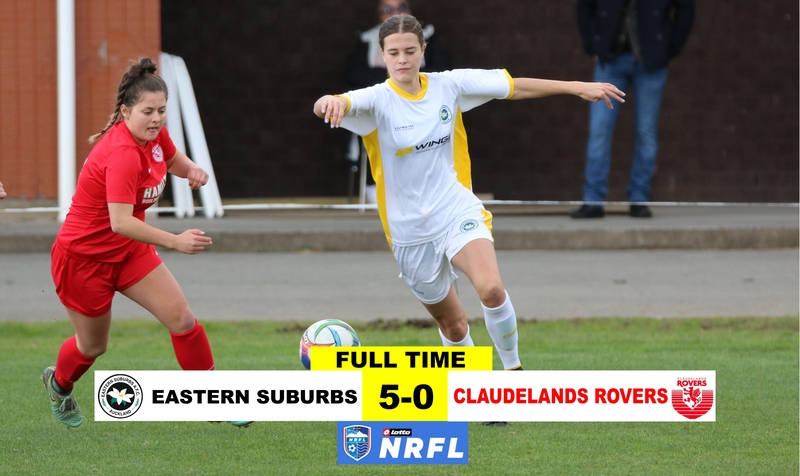 After the heartbreak of going out of the Kate Shepherd Cup on penalties on Thursday evening, Eastern Suburbs ladies were in need of something to lift their mood, and this game delivered that as Claudelands offered very little threat despite the much changed suburbs line up. Suburbs started slowly – it was almost as if they were still thinking through that bruising Thursday night encounter and still expecting their opponents to pressure them aggressively as Glenfield do. However, this didn’t happen and they soon realised they had much more time on the ball against bottom of the league Claudelands. Suburbs midfield began to dominate the game and their attacking duo of Jade Parris and Hannah Pilley were able cut through the Claudelands defence almost at will. After a few unsuccessful attacks involving intricate passing and runs down the flank, Jade Parris decided the best course of action was to take on defenders herself straight down the middle. It was one of these powerful runs that provided her first goal, out-sprinting the defenders and shooting from the edge of the penalty box. The Claudelands keeper stopped the shot but couldn’t gather the ball and Parris had continued her run to pass the ball into the net from the rebound. A few minutes later Suburbs got their second, again through the middle as Parris threaded a well weighted pass to Hannah Pilley who calmly side footed past an on-rushing goalkeeper into the corner of the net. The third goal was almost a copy of the first, as Parris again held off a number of Claudelands defenders to power through and finish well. With the score at 3-0 at half time and with Suburbs in full control, the supporters were looking forward to a goal fest in the second half. However, Claudelands had changed a few things at half time and began closing Suburbs down much quicker. They also managed a few attacks of their own through their pacey forwards who caused Suburbs a few problems at the back. The Lilywhites finally regained their composure halfway through the second half and Parris again found herself running onto a through ball from Pilley which she dispatched into the corner of the net. Shortly after this another run down the right wing by Pilley resulted in a firmly struck cross hitting a defender and wrong footing the keeper for an own goal. During the final 15 minutes of this match Suburbs huffed and puffed but couldn’t break down the battling Claudelands defence. They were restricted to a number of long range shots that struggled to make an impact against the strengthening wind. It was good to see some new faces being introduced to the Suburbs team as the match wore on. Ruby Rimmer and Ella Russ, both reserve team regulars, came on as second half substitutes and made good contributions. To be fair, the result should have been much more emphatic than this given Suburbs dominance of this game and the number of chances that went begging, but at the end of the day they will be happy with the three points and a relatively relaxed match after their recent exertions. 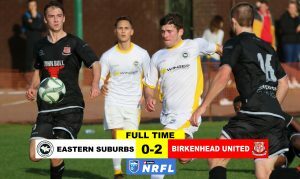 Eastern Suburbs Premier Men’s Team played Birkenhead last Saturday at Madills Farm losing 2-0. Suburbs had several changes due to injuries and players returning to the States to continue their University studies. Play see-sawed back and forth with Birkenhead having the best opportunities to score. After 20 minutes, Suburbs were caught short in defence on the right side and Lachlan McIsaac used this well, drew the keeper and slotted home comfortably. Suburbs continued to attack but unfortunately could not convert. Birkenhead then found space through the middle with Alexander Grieve scoring from close in to go 2-0 up. The second half was evenly contested with both teams having good scoring chances but could not convert. Birkenhead had the better share on attack and definitely deserved to win. Players to shine for Suburbs were Michael Built, Kingsley Sinclair and Kelvin Kalua. Eastern Suburbs battled through to win a hectic game under floodlights at a chilly and foggy Seddon Fields on Friday evening. As always, it took a while for the suburbs ladies to settle on the fast artificial turf and the first twenty minutes were unstructured and messy. The swirling fog that drifted in and out from the nearby bay made things problematic for both teams and at times it was difficult to see what was happening on the other side of the pitch. Suburbs were also without a few of their regular players due to other commitments and so it was a different line up to usual. Despite the untidy start, Suburbs managed to force a few corners and after 20 minutes one of these was floated in by Jade Parris, causing some panic in the western springs defence. The loose ball was jabbed home by Rebekah van Dort. After this, Suburbs settled into their stride and began playing some more flowing football, keeping the pressure on the Springs midfield and defence. After half an hour they had another goal from close range as Molly Bryans managed to get her foot to the ball during some frantic defending by Springs. 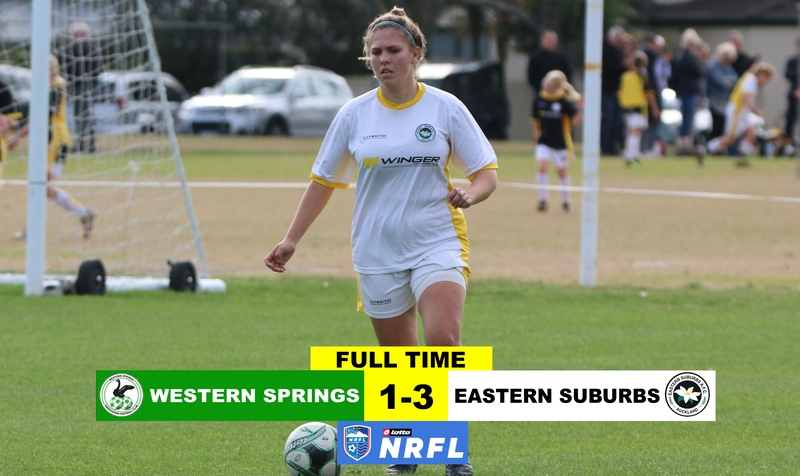 Western Springs were much more organised in the second half and suburbs struggled to get out of their own half for long periods. Springs dominance was rewarded after ten minutes as they forced a corner which was forced over the line by Rebecca O’Neill and this gave them encouragement to push even harder during the remainder of the match. Suburbs managed to withstand the pressure although there were some heart stopping moments as Springs created chance after chance. Suburbs keeper, Corina Brown made a number of athletic saves to prevent the home team getting on level terms including one that seemed goal-bound when she just managed to tip it onto the cross bar. With five minutes to go and still under pressure, Suburbs managed to break out of defence and release Hannah Pilley down the right wing. Her cross found Amber Whitley who made no mistake from close range. Although it was not a classic performance, Suburbs will be happy to come away from Seddon Fields with this result as these Friday evening games always seem to present them with some problems. They can now take the weekend off and wait for the other results to come in. 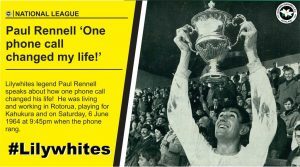 The following article provides the second part of Paul Rennell’s ‘One phone call changed my life’ story when he joined Eastern Suburbs in the mid 1960’s. Paul captained some of the Lilywhites most successful Premier teams, he also went onto captain the All Whites. Paul is now the Patron of our club. ‘After flying back and forth from Rotorua for three weeks while I served out my notice with my employer, I finally arrived in Auckland on Friday, 26 June 1964. We played Eden on Saturday at Glover Park and won convincingly 7-1. John Wrathall scored four goals, Dave Buller two, and yours truly one. 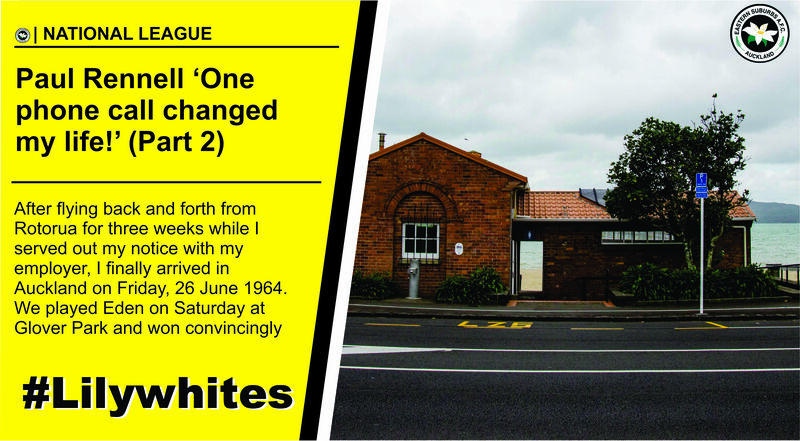 Strange, but my first game for Suburbs against Mt Albert was the beginning of a winning streak which ended when we lost to Mt Wellington on Saturday, 1 May 1966. It must have been a lucky charm when I joined Suburbs! On Tuesday, 30 June I met Ken Armstrong at work and he took me to my first training run at the St Heliers Bay Reserve. We parked in Goldie Street and when we got out of the car he said “there is your changing sheds” pointing to them and said “there is your shower afterwards” pointing to the tide. I thought what the hell have I got myself into! One phone call changed my life! I was living and working in Rotorua, playing for Kahukura and on Saturday, 6 June 1964 at 9:45pm the phone rang. My landlady answered it and said it is for you. I answered and the voice on the other end said “Ken Armstrong, Coach of Eastern Suburbs speaking”. I said “what do you want?” “I want you in Auckland next Saturday to play Mt Albert at Anderson Park.” He told me he wanted me to strengthen their mid-field. I said “I play inside forward and if I can’t play there I won’t come” and hung up. Five minutes later he called back and said “I don’t lose very often, but you can play inside forward, so I will see you next Saturday, 1:45pm at Anderson Park”. Apart from Ken and Charlie Dempsey, nobody knew I was coming. Ken met me and took me into the changing sheds and introduced me to the team. You could have heard a pin drop when Ken handed me my strip. I had jersey 6 which I said is not inside forward. “I know” he said “but the programme has you wearing 6 but you are playing inside forward”. When we ran out on to the field you could hear the supporters saying “who is this skinny bast*rd. He will never last the game”. We won 4-1 and I had a very pleasing game setting John Wrathall up with two goals. In the Clubrooms after the game, David Garrett said “what drugs do you run on?” I put my hand on my stomach and said “guts”. One game down, one win and welcome to The Lilywhites and a life in Auckland. 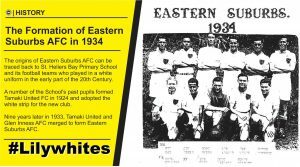 The origins of Eastern Suburbs AFC can be traced back to St. Heliers Bay Primary School and its football teams who played in a white uniform in the early part of the 20th Century. A number of the School’s past pupils formed Tamaki United FC in 1924 and adopted the white strip for the new club. Nine years later in 1933, Tamaki United and Glen Inness AFC merged to form Eastern Suburbs AFC. Preliminary meetings around name and kit colours see-sawed from retaining Glen Innes’ name but with Tamaki colours and vice-versa. 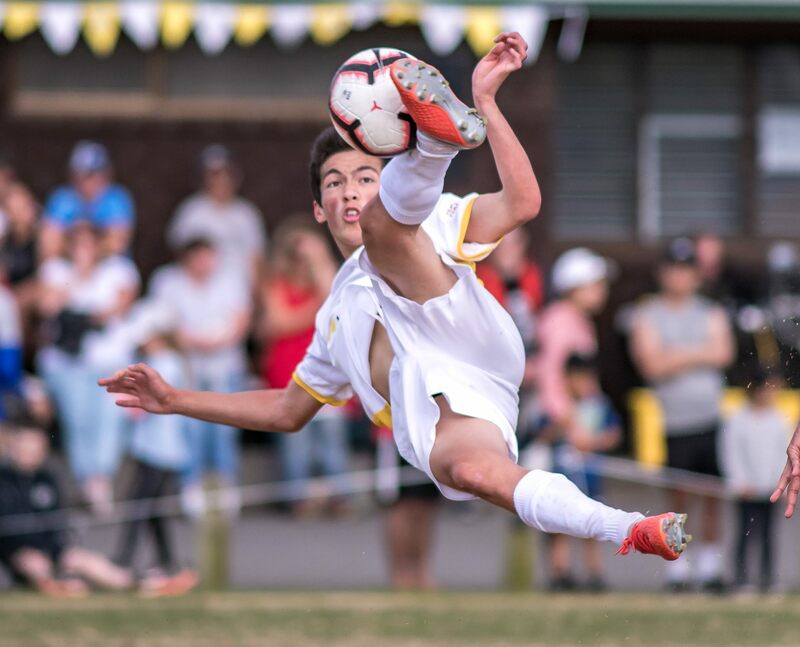 A decision was reached to name the club Eastern Suburbs and adopt the white kit (the colour of Tamaki United) and a chocolate and gold badge (in the style of Glen Innes) – the very colours that make up the Suburbs kit today. Suburbs inaugural game was played against a Grey Lynn based club called ‘Comrades’ The game was played at St. Heliers reserve (now known as Vellenoweth Green) on Tamaki Drive, and resulted in a 5 – 3 triumph to Suburbs. Comrades was a Grey Lynn based club, and after a number of name changes and merges it is now part of Western Springs AFC. 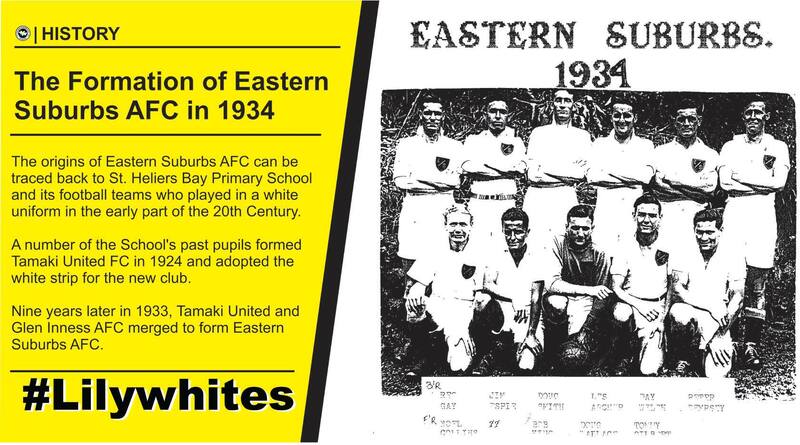 Eastern Suburbs quickly established itself as a club of force, becoming Auckland FA Champions in 1948, and won their initial Chatham Cup trophy in 1951. 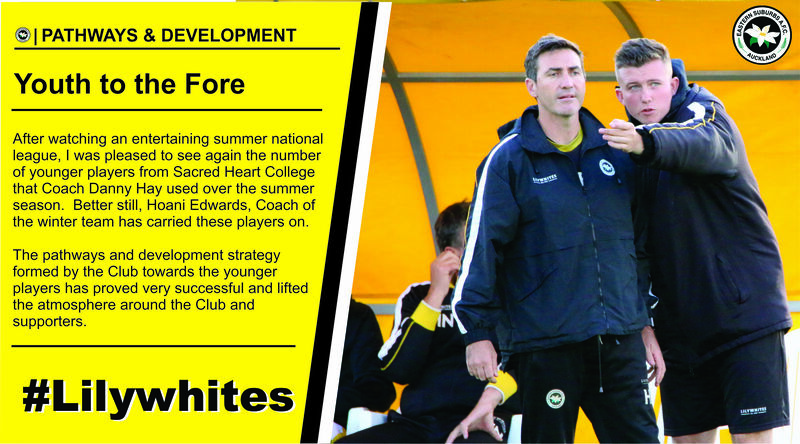 After watching an entertaining summer national league, I was pleased to see again the number of younger players from Sacred Heart College, Auckland that Coach Danny Hay used over the summer season. Better still, Hoani Edwards, Coach of the winter team has carried these players on. The pathways and development strategy formed by the Club towards the younger players has proved very successful and lifted the atmosphere around the Club and supporters. To manage this scheme the Club under Danny Hay, has employed full time quality and specialist coaches, with the result of better young Lilywhites coming through on both men’s and ladies’ teams. 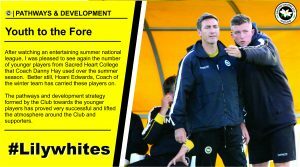 Hoani’s first team squad consists of 26 players which include Michael Built (Coach) and eight players currently attending Sacred Heart College, ages from 16-17 years. The average age for the squad is 20.64 years. Campbell Strong, Kingsley Sinclair, Charles Spragg and former graduate, Kelvin Kalua have all performed very well and have supported to the hilt Tim Payne (Captain) and the older players. They have all contributed to the good standard of football that the team have been playing, hence their second position on the ladder. Credit must go to Hoani and Kane for their great efforts in coaching and preparing the lads for battle. Keep up the good work and give us old supporters something to cheer about!